In some ways a trip to the theatre can be compared to a photograph – it is a moment that encapsulates a specific period of time and emotions. The only difference is one image is recorded in your mind, the other recorded on a glossy sheet of paper. After the moment is over, life goes on and like other memories that fade or become altered with age, the image one captures from a theatre experience will not change, nor will a photo. Inside the Cort Theatre awaits an unforgettable experience that will leave an indelible impression on the consciousness. Time Stands Still is a timeless piece of art that will leave viewers captivated and questioning the world around them. 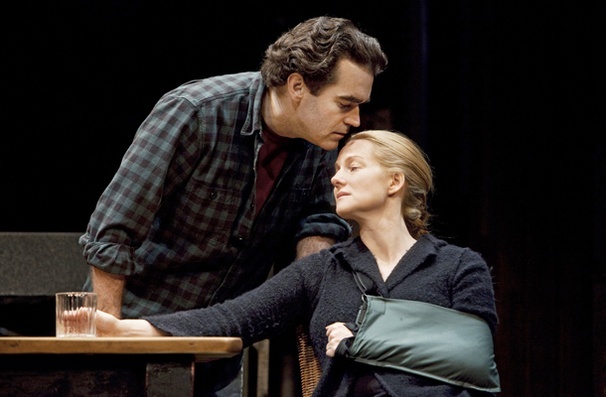 Written by Donald Margulies, the play premiered in February 2009 at the Geffen Playhouse in Los Angeles with Anna Gunn, David Harbour, Robin Thomas and Alicia Silverstone performing the play’s four characters. 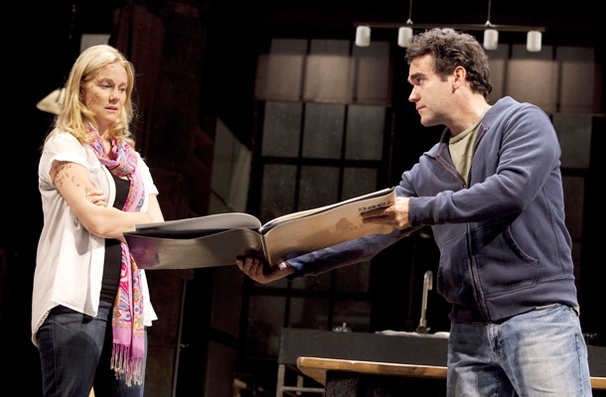 In January 2010, it began its initial run on Broadway with Laura Linney, Brian d’ Arcy James, Eric Bogosian and Alicia Silverstone as the only cast member to reprise her role. When I first heard about Time Stands Still it was creating quite a stir and receiving rave reviews. Tickets were as hard to find as the Willie Wonka golden chocolate bar wrapper. 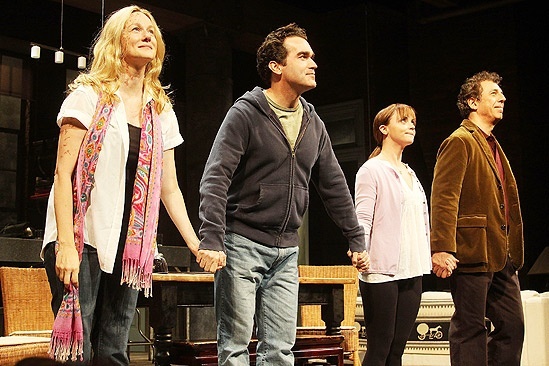 By the time its first Broadway incarnation at the Manhattan Theatre Club’s Samuel J. Friedman Theater ended on March 27, the play had garnered two Tony Award nominations for Best Play and Best Performance by a Leading Actress in a Play for Laura Linney. I had thought I might have been jipped out of one the best shows of 2010 and was ecstatic to read that the show would resume in September after a brief hiatus to allow Ms. Linney to fulfill scheduling commitments for The Big C, a new series on Showtime. Now playing at the Cort Theatre, the original Broadway cast has reprised their roles with the exception of Alicia Silverstone; Christina Ricci was cast in her stead. 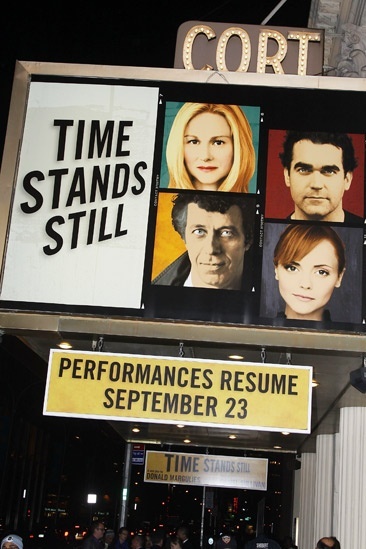 With Time Stands Still, Donald Margulies has crafted a modern masterpiece; it is a sociology exposition done right. He scrupulously places the elements of new millennium relationships, beliefs and society under a microscope, dissecting each aspect until its essence is exposed and theories are challenged. 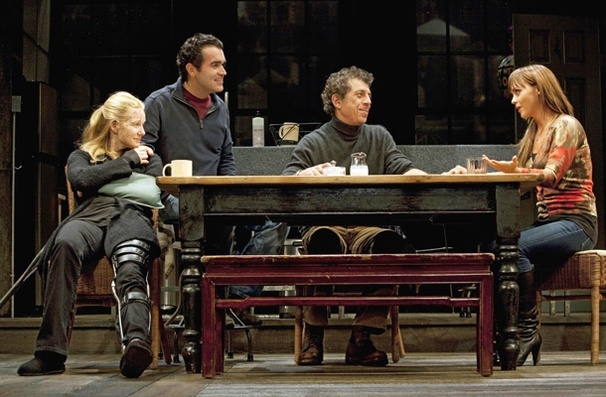 The play involves two couples Sarah (Laura Linney) and James (Brian D’Arcy) and Richard (Eric Bogosian) and Mandy (Christina Ricci), but centers on the relationship between Sarah and James. Sarah and James are war correspondents; she is a photographer and he is a reporter. For nine years they have been shacking up together and documenting the most gruesome aspect of the human condition. As the play opens, Sarah had just been severely injured in a car bomb explosion in Iraq and has returned to their Brooklyn apartment to convalesce. James recently survived a jarring experience which led him to leave Sarah in the Middle East and is now wracked with guilt. Shortly upon their arrival back from a hospital overseas, they are visited by Richard, a photo editor and friend, and his newest love interest Mandy. Richard suggests that since Sarah is recuperating, her and James should collaborate and create a coffee table book of their experiences in Iraq with her photos and his commentary. But as Sarah and James begin working on the book, infidelities are revealed and life as they know it also questioned. James is ready to try a more conventional life and Sarah is addicted to the adrenaline rush and is reluctant to change. The cast brings this stellar story to life with compelling conviction. Sarah finds solace in the square of the lens. The moment she clicks the chaos of her surroundings, the world is silent (hence the title Time Stands Still). She finds excitement and a sense of duty by showing the world the atrocities of war. Most of all she is unabashedly unconventional. 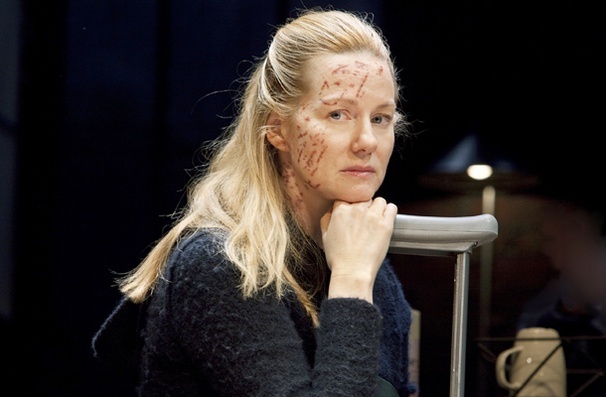 Laura Linney is one of the most inspiring actresses of this century. Her talent enriches the complex relationship Sarah and James share. She is able to penetrate the core of Sarah’s personality and bring across all her fearlessness, flaws and vulnerabilities in a poetically human performance. Laura Linney’s Tony nomination was well deserved; her depiction of Sarah is one of the most riveting displays of acting prowess that was offered this year. Brian D’Arcy’s acting chops have been well-honed on stage and his portrayl of James is another magnificent testament to a skillful Broadway veteran. James is a man who has hit a wall going 100 mph and is on the precipice of change; in fact, he needs it in order to move forward. The subtle desperateness D’Arcy exudes as he struggles to hold on and fix a relationship that is slowly disintegrating is genius and vividly sets up the tug-of-war aspect as the future of Sarah and James’ relationship is explored. Eric Bogosian is probably best known from the 1988 film Talk Radio and his role on Law &Order: Criminal Intent as Captain Danny Ross, but he is also an accomplished novelist and playwright. His understanding of character development has served him well with an engaging portrayal of Richard. In the wrong hands Richard could easily become a less memorable character, but Bogosian brings him alive with wittiness and grace. Charm and exuberance are two traits Christina Ricci has in ample supply; she is one of the most interesting young actresses in Hollywood. She could not have made a better Broadway debut than the role of Mandy. Mandy’s youthful, naïve way of seeing the world and her devotion to Richard is the catalyst that inspires the questions and sparks the conflict in Sarah and James’ relationship. Ricci turns a character that could be perceived as a bubblehead into a sweet, profound young lady. She and Eric Brogosian’s performances are the perfect compliment to acting superiority of D’Arcy and Linney. This play lacks nothing. By the final curtain close I was rushing to my feet to give this show and its cast an enthusiastic standing ovation. Time Stands Still has all the elements of 007 martini – all the best ingredients shaken to perfection. Mature and momentous, to miss this show is to deprive yourself from a truly enthralling and entertaining theatre experience.